Due to the 12' baseboards lying on my front room floor and to the rest of the renovation mess, I didn't put a full-sized live Christmas tree up this year for the first time since 1998. No, I dug out and assembled the little Bottle Brush tree I purchased when I was a sophomore in high school back in 19-mumble-mumble, set it on top of my new old piano, and loaded it with as many ornaments as I could. And festooned the potted rosemary shrub with a few more. But for your delight and delectation, here's a vid of my tree from two years ago. God willing, by this time next year I can take another tree video and all the woodwork you see will be stripped, refinished, and done. A few minutes ago, 12:26 AM, and my student AutoCAD program died for real. 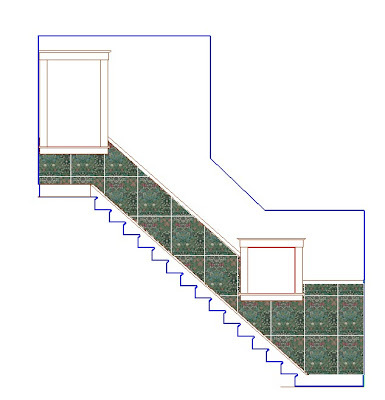 I was almost done doing up one last sketch elevation for my upstairs bathroom, when suddenly the command prompt froze and I couldn't get back to the layout to print it. Fortunately, I had saved it to pdf in progress, but it's not as pretty as what I was working on. Oddly, model space stayed with me for a few minutes more, and I got a screen shot of what I was doing. Was going for a screenshot of something else I wanted to save, but I hit the zoom button the wrong way, and when I tried to zoom back in-- or was it out?-- everything in model space was gone.
. . . Just tried again. All the way out, all the way in. Nothing. Well, with the pdfs and screenshot jpgs I've got my work in a form I can look at and hand-sketch over. But now that I've gotten used to this program, what are my options? 1. Buy the professional version, for $1,000 to $1,500 for the "lite" version; for up to $4,000 if I want all the 3D bells and whistles. Yeah, right. 2. Renew my student license, either through the tech school or a local retailer. That'd be a lot cheaper, but do I really want all my drawings to go on saying "PRODUCED BY AN AUTODESK EDUCATIONAL PRODUCT" for the next fourteen months? 3. Find work with an architect who has AutoCAD 2008 and who'll let me install a licensed copy on my home PC-- for the convenience of the firm, of course. At the moment, something might be happening along those lines . . . sorta . . . but the architect in question is running AutoCAD 2007. And I don't think I can convert files backwards. 4. Wait a year or two until AutoCAD 2008 is considered out of date and the price goes down. I mean, I won't be redoing my bathroom before then. And I have the pdfs in the meantime, if I want to dream . . . This past week I've been staring into the face of Doom. The expiration of my 14-month student AutoCAD 2008 license was looming up before me; yea and verily, an on-screen notice a couple days ago gave me to understand that at the stroke of the midnight just past my program would fold up like Cinderella's coach-and-four and I'd have no more access to the drawings I've been doing on my house. 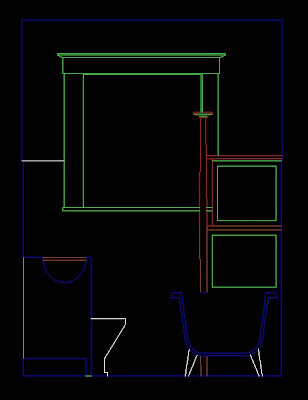 So all day and all evening today-- yesterday the 16th-- I've been drawing and drawing and printing things out and saving things as pdfs and using this cute little app I have called FastStone Capture to get screenshots of all my plans and elevations. 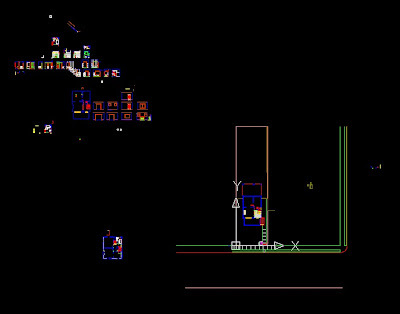 All right, I got my site plan decluttered. I created and named a new layout tab for it, but when I opened the viewport, nothing was there! I tried zooming in and out to find it, but all I had was white space and the X-Y axis marker! Huh?! Is this what happens when your license runs out while the program is open? Everything on your layouts disappears? No fair! It's only 11:57! Uh, no, checked the caller ID on the phone. 12:01 AM. Oh. Nothing I can do about it now. So I opened my documents file and checked the pdfs and jpgs I'd stored. Pretty good job of getting them all filed away . 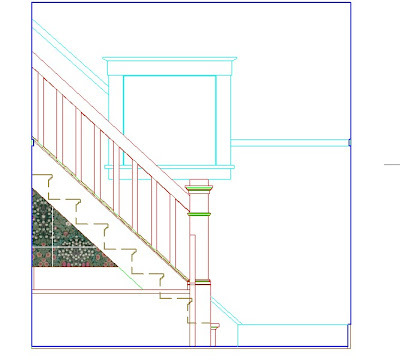 . . then I switched back to AutoCAD. Hmm, funny. I could still open model space. And draw in it. And look, some of the layout tabs were showing just what they ought to. Does the program close down piece by piece, bit by bit? Short answer, no. Turns out it's my own fault I can't see most of my drawings-- they got disassociated from their layout pages when I moved all those plans and elevations in model space. I was trying to get them back where they belonged when I suffered a Fatal Error and had to close the program. Yes, it opened again. And the on-screen notice said my license expires tomorrow. Meaning today, but long enough for me to stop cranking and get some sleep. I'm not turning into a pumpkin quite yet. The furnace is fixed. Apparently. I hope. No heat all day Saturday. That afternoon I made a batch of sugar cookies, but 350 degrees in a modern oven doesn't do much to warm up the kitchen, let alone the house. The house temperature went down to 44 and stayed there. Oh, well, the cookies rolled and cut out beautifully on the marble board. No trouble with sticky dough at all. In the meantime, I turned off the pilot light and the gas to it. No point in running it if it wasn't going to do any good. Just as an experiment, though, I turned the ignition back on around 7:30. Went upstairs to make some phone calls, came back down twenty minutes later, and hey, presto! the furnace was on! And proceeded to run the thermostat up two degrees above its setting. No complaints about that. Went to bed, woke up yesterday morning, and the furnace was off. Again. 50 degrees and dropping. 49 degrees by the time I left for church. It was a very good day to have things scheduled outside the house until nearly 7:00 PM. I returned to find the inside temperature stabilized at 43 degrees (21 outside). Made another batch of cookies. And lots of hot tea. The coldest part was unloading the dishwasher. Those stoneware plates and bowls were freezing! A bit before 11:00 PM, I tried the ignition again. Just for fun. And what do you know? the heat kicked on! I goosed up the thermostat to a temperature I figured would require the furnace to stay on all night and not cycle off, and apparently it worked. I still had heat this morning. But that didn't solve the problem of why the system wasn't working properly in the first place. Around 8:00 this morning, I got a call from the heating and cooling people. A third person, different from either I'd spoken to before, was on the line. "Your heat is off?" he asked. I went downstairs to check the thermostat (the register in the bedroom never gives much heat; no point checking that). 59 degrees. "Let's say I have intermittent heat." And I described what had been going on. "Could it be your air filter?" What? I went through this with their other guy on Friday! "No, I just replaced it less than a month ago." "It still could be dirty." "I checked it on Friday. It's gray, but not filthy." "Do you have a programmable thermostat? Maybe it's just the program cycling off." "No, I don't have it set that low!" "Well, maybe it's the factory settings." I about lost it. "Nooooo!!! At 43 degrees?!" Good grief, man, don't patronize me! And don't you guys communicate? I went through all this with your colleague the day before yesterday! "Do you have the serial number?" I asked. Of course he didn't. He didn't have anything. But he said, "I'll be out within the hour." More like an hour and a half. The serviceman was younger than I'd visualized. Funny, but his questions had made me imagine a middle-aged, burly, "I've-got-all-the-answers-and-the-homeowner-knows-nothing" type. I apologized for having lost my patience with him (if other people are acting like idiots, no point in being an idiot yourself) and showed him downstairs. Having turned off the furnace, he turned on the now-futile ignition. "This unit doesn't have a pilot light," he said. "It's not on all the time. It's got an electric ignition. Did you hear this clicking when it wasn't turning on?" I listened. "Yes, but I thought it was the metalwork rattling or something" (guess this homeowner doesn't know everything!) "You mean it's like the burners on my gas stove?" Yes, indeed. Having fished my calico cat out of the bowels of the furnace, I took myself and her upstairs and left him to it. And after a few minutes of poking and prodding, after him having me jack the thermostat up to see what that did, after some turning off and on of switches, the serviceman called me back down the basement. "It was your ignition sensor. Your pilot light was coming on, but the sensor couldn't tell, so it wasn't turning the gas on. I've cleaned it, and I've shut the furnace off and on twice to make sure. Here, I'll do it again." He hit the switch (which is, as I'd recalled, at the breaker box) off, then on. The furnace shut off, then powered back up. "I think that was it." And apparently it was. He took the home warranty call fee and went on his way. And God willing, that will do it. Though I can see that getting somebody out to clean the whole shebang wouldn't do any harm. But not this firm, most likely. I'd like somebody who's a little better at internal communication. I assure you, I am not that energy conscious. Nor that cheap. My dad was that cheap. He removed the furnace from his house entirely and got through the Midwestern winters by wearing his overcoat constantly and running space heaters in closed rooms. He swore he wasn't going to give the gas company any more than he absolutely had to. I, too, economize on energy. But not that much. I routinely set the thermostat back to 55 degrees at night and stay warm and cozy under five covers and three cats. But by 8:37 in the morning I really do expect the temperature to be heading back up towards 61. Wednesday morning, the thermostat said 53 degrees when I got up, but the furnace straightened itself out. Probably had nothing to do with the fiddling I did with the fan switch. Thursday morning was a bit warmer outside: no trouble with the heat. Friday morning, yesterday, the outside temps dove back into the mid-20s. And my thermostat read 52 degrees. Then 51. I called the home warranty people, who had a heating and cooling repair company call me. Yes, sir, the furnace motor is going. No, sir, the fan and the gas burner are not running. Yes, sir, the pilot light is on. No, sir, I can't seem to find the switch for the furnace motor. Yes, sir, I've found the label inside the furnace . . . oh, look, I think it says this unit was installed in 1987! No, sir, that is really not surprising, it was my POs-1 who put in the forced air system . . . No, sir, I still haven't found the switch you describe . . . oh! look! the burner and the fan just came on! That's good, the heating guy said, because they were pretty booked up that day. Call them back on Monday to let them know if they should still come out. I did not wait till Monday. Not with the thermostat reading 46 degrees F. Not with it again in the 20s outside. A number of calls and some futile fiddling with switches later, the maintenance guy has determined the problem is the module. Which he can't get till Monday. And hopefully it's not some other part I forget the name of: that'd mean replacing the whole furnace. Meanwhile, I get to rough it through the weekend and most of Monday. Baking Christmas cookies was not on today's calendar. But, um, I think I just changed my plans . . . According to my doctor, I've contracted The Bronchial Crud That's Going Around. Doesn't make me too fit to strip woodwork these past couple of weeks. But maybe that's just as well, since my student AutoCAD license expires on the 17th of this month, and after that I won't be able to open the program, let alone practice on it or play with it. 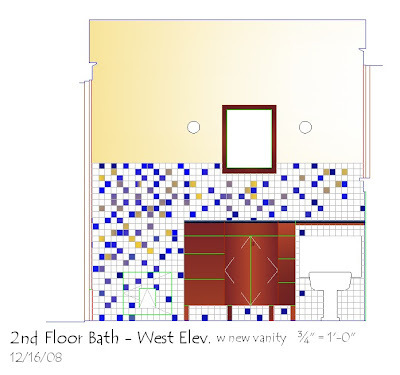 But as long as I've got it, I'm using it to document some features of the house, and maybe to work out some ideas I have for the upstairs bathroom. 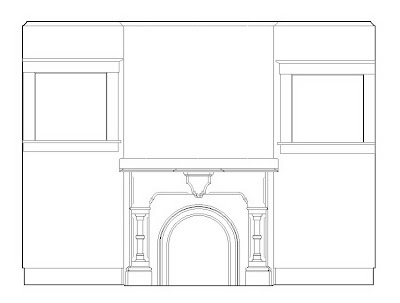 The last couple or three days have been devoted to doing an as-built drawing of the living room fireplace. 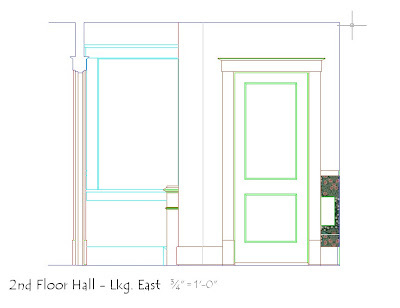 It certainly is a unique feature of the house; I'm thinking it wouldn't be a bad thing to have a measured drawing of it stored off-site in case anything happened. Here's the results so far. So far and maybe no farther. I've left off the surface ornament, but I've got plenty of photos to show that. But did I say this was an "as-built"? Not exactly. 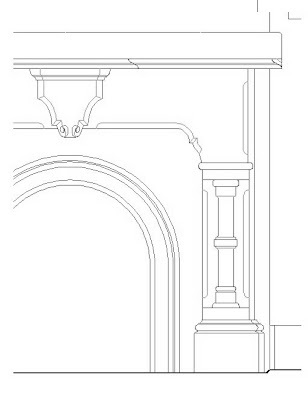 My fireplace exhibited the same phenomenon as did my staircase-- regardless of how many measurements I took, no matter how often I checked and double-checked them, I couldn't get all the dimensions to agree. In some places it's as much as an inch off, but I can't adjust that inch without throwing other dimensions into chaos. I tell myself it's because the mantelpiece has settled and it's out of true. But not that far out of true! Surely, I'd notice it if it were. It'd drive me crazy looking at it if it were! But it doesn't. I don't know . . . one more instance of the house keeping its secrets . . . I got home from choir practice around midnight tonight. The idea was to take the dog out, then go straight to bed. But today (Monday) I got little or no woodwork stripped. So I thought I'd cover the floors in my living room and hallway so tomorrow (Tuesday) I can get right to work stripping in place the casing and sill of the communicating portal. 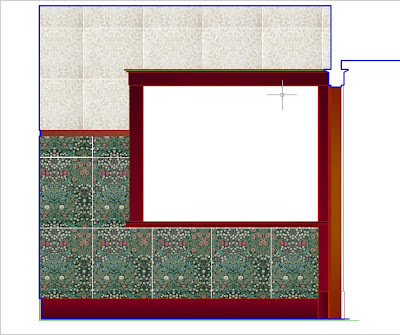 But can I-- ought I-- be using the heat gun on the underside of the sill with the wallpaper there? So I pulled it off. Both sides. Living room paper came off more easily and completely; hallway side came off in layers and will need wetting and going over with a Paper Tiger to finish the job. But those portions a re gone, gone, gone. And randomly and casually or as a deliberate effort, the rest of it will soon follow. If I had any thought of living with those beige papers for any longer, it's gone gibbering away. The point of no return has been passed. 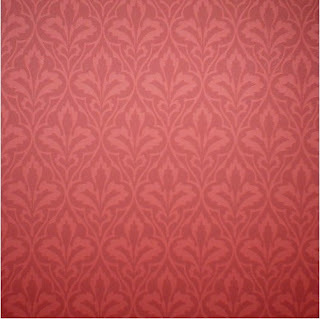 I dreamed, first, that all the wallpaper was off my dining room walls, and I had nothing but white, bare plaster. 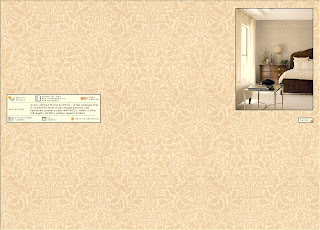 And it seemed that I could perceive something behind the plaster, between the studs, in one corner of the room. There were some people there with me, and one of them, a woman who reminded me of my mother, told me, "You have pregnant women in your walls." Though unexpected, this didn't seem alarming or uncanny at all. It evoked no echoes of poor injured girls murred up behind stone and mortar in old Gothic tragedies. No, I was brought to understand it was a rare but natural development in old houses, a chemical effect resulting from age and plaster and the stuff that falls down inside stud and lath walls. Totally to be expected. But then it seemed that time went by, and the pregnant women in my wall did what pregnant women do: They got bigger and bigger. There were three of them behind the plaster, standing in a row between the studs, facing outwards, arms down to their sides. I could now clearly see their full breasts, their fecund bellies with navels like demitasse cups, telegraphing through the white wall surface, pushing it out into the room. I couldn't take the situation for granted anymore. Whatever they were, human or dryad, however they had come to be there, these women would soon give birth, and how could they, how could there ever be room for them and their babies, trapped inside my wall? They had to be set free! "We have to cut open the wall!" I said to the people with me. One man produced a large carving knife, but I said, "No, don't use that! You might hurt the women, and anyway, if they saw it, it would frighten them and maybe affect the babies." So I got a small paring knife instead and started to work, carefully carving chunks of plaster away. The dream changed then, or my dog barked and woke me up, so I never got to see what the women looked like, or to learn what became of them or their babies. I have no idea with this means. That I'm thinking about the built-in cabinet my POs-1 took out fifteen-twenty years ago? 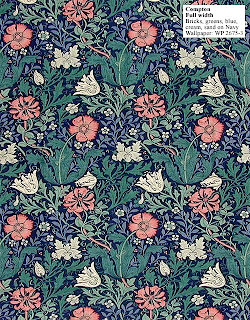 That I'm over-obsessing about wallpaper choices? 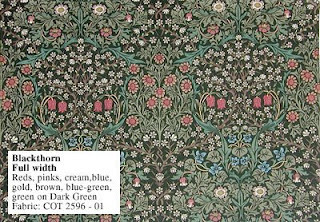 Or that, seeing how I settled on the paper I want for my dining room wallpaper five years ago, I'm excited but a little apprehensive now the time has come actually to order it? Or maybe it just means I should watch what I eat before I go to bed! I reached the one-third mark in the woodwork stripping yesterday evening. But not much is going to get done on it this week, as most of my time through Sunday is booked up on presbytery and music related commitments. Too bad I can't keep going, since I'm eating into the woodwork in the 1st floor stairhall, and it's falling to my pry bars right, left, and center. In fact, it's looking rather skeletal in there since Saturday evening, especially in the corner where it's now down to the studs. Last night I pried off one of the 1/4" plywood facings on the doorway between the hall and the front room. Guess what? It covered up the old door strike mortise. What did I expect? That's where the front door used to be! The real question is, what am I going to do about it? Lots of interesting cracks and holes revealed once I pried off the baseboards. Good thin g I'm not worried about nasty things crawling up from the basement! But I like the idea of laying down tile board before I put the baseboards back. The thought of wall-to-wall floors is most appealing. Meanwhile, I boxed up more books in the living room, so I could move the bookcase and get at the last two pieces of baseboard in there. Look squalid and self-sacrificing enough for ya? And what would the betting line be on whether I'll have any of this put away by Christmas? My dream and desire for my house is to get rid of all the clad metal windows and replace them with three-over-one double-glazed wood windows that will reproduce what was here originally. But the grim truth is, it's not happening before this winter, and I have two of the existing windows with bad seals and if I can help it I'd rather not go through another winter with them wasting energy. My previous owners left me no record of who installed the metal windows and I couldn't find any mark on them to say what brand windows they are. But they were definitely put in by my POs-1, and I recently learned they (or at least, she) still live in the area. So this afternoon, I called Mary Kathryn N. and asked her about the windows. How easy: she remembered exactly what brand they were and who installed them. I'll call the company on Monday and see about getting a rep to come out. But as long as I had her on the line, I asked her a few questions about the Sow's Ear . . . well, more than a few, actually. Kathryn C. McL was in her 90s when she sold Mary Kathryn the house in 1981. The woodwork was already painted then. "I wanted to strip it," Mary Kathryn told me, "but with the kids there was never time. So we just painted it." How funny! My POs John and Kate wanted to strip it, too, but couldn't because of their kids. So the job has come down to me. The front porch was already converted to a closed-in front room, with a triple-width opening between it and the living room and a double-width opening between the living room and the stair hall. "It was ridiculous. There was no place to put furniture in the living room. But we liked the openness." So they filled in the doorway at the bottom, and left the communicating portal I have now. They "completely redid the plumbing" in her time, since the soil stack burst and made a terrible mess. Me, I knew the one I have is fairly new, but it's nice thinking how I dodged a bullet on that one, by several years. She couldn't remember whether or not she and her husband applied the drywall to both sides of the wall between the dining room and kitchen, but I'm thinking they must have, since they took out the cabinet. The funny thing is, she clearly remembers putting in the beige Victorianesque dining room paper with the pink roses, but not the cream-on-white silk stripe paper on the drywall under it. "That sounds too modern for me. We tried to do things we thought fit the house. We didn't want to 'remodel,' if you know what I mean." 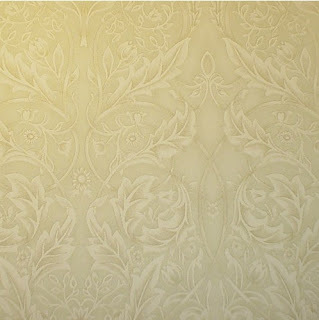 She definitely remembers removing "ten layers of wallpaper" from all the walls. And all about the fireplace, and the fancy marble mantlepiece they installed. Turns out they did not perpetrate the messy common brick firebox-- it was like that when she moved in. And it had an old gas log connection, which they took out because they were afraid it might leak. They thought about putting a new one in, but never got around to it. I could have asked more questions, but Mary Kathryn had places she needed to go. It verged on irony reflecting how our tastes differed and how I've taken out some of the features she was very proud of, but why bring it up? She, and John and Kate after her, did a pretty good job of keeping the old house sound and in good repair, and now it's up to me to do the best I can in my turn. But now I'm haunted by the strange picture of old Miss Kathryn C. McL getting bored one day and deciding to paint the stairhall aquamarine and slopping paint over the woodwork while she was at it. She or her parents, since clearly Mary Kathryn N. wasn't responsible! Today I went to Lowe's to buy 3" exterior grade screws to reattach my fallen fence, and 1/2" metal screws to rehang my back screen door, which is falling off its hinges. I made another visit to Hamilton's Tools, for another nail puller-- the nasty 3" nails in some of the trim I'm taking down has proved impossible for me to get out with the nail puller and pliers I have. And I stopped by the Home Depot, because for some reason Lowe's (nor WalMart, nor anyplace else I looked) doesn't carry #0 steel wool, which I need for use with the wood refinisher. While there, I cruised their tile section, not expecting to find anything. 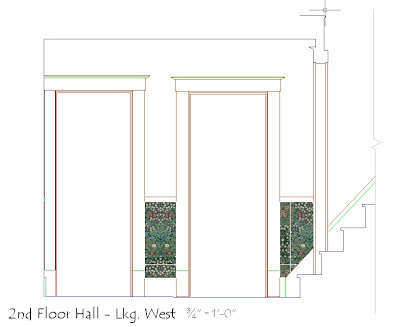 I really want to replace the vinyl junk in my 1st floor stairhall with something on the lines of the old Medieval/19th century encaustic tile. 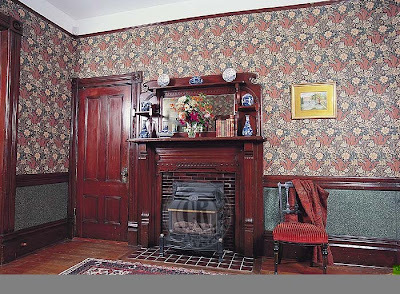 It looks so good with dark woodwork and William Morris patterns. 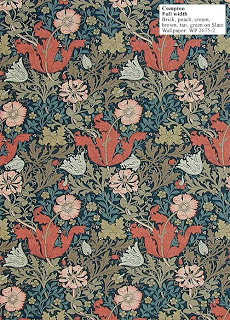 I have medievalist tendencies from way back, not to mention encaustic tile reminds me of north Oxford, which is another story. But it's brutally expensive, to the point you'd almost want to just use accent pieces set in metal inserts, so you could take them with you should you have to move. Not the real thing, far from the real thing, but definitely working towards the effect of the real thing. And a dickens of a lot cheaper. I'm glad I don't have to make a decision about my hallway floor for awhile. Because before I do, I'll have to fight the battle of You'll Never Be Able to Forget It's Not Real! vs. The Cost of the Real Stuff Is Way Out of Proportion for This Little House! But it's nice to know this tile line exists, should Sense ultimately win out over Sensibility. When I got home, I immediately set to work trying to fix the aluminum screen door, before I lost the daylight. I won't go into how that proceeded; it's done well enough to close properly again, even if it does need a stronger hand than mine to tighten the new screws in as well as they need to be. But I had the door propped open as I worked, and the dog and my eldest cat were in and out. After I got done, I went out in the back yard to make sure the kitty hadn't wandered into the neighbors' yard through the gap in the fence. And then for the first time since I got home I noticed it: There is no longer a gap in the fence. Sometime this afternoon, my neighbor must've fixed it! The panel is about an inch lower than it was, probably because the ends of the old 3" screws were in the way, and he didn't cut or remove them. Call the difference a souvenir of the Great Windstorm of 2008. But I think I owe my neighbor a lawn mowing or two. Or something. And does this mean I can take those long screws back to Lowe's? I was rather hoping the limbs that broke off my sugar maple the other night included the one that hangs down so I can't see my vegetable garden out my bathroom window. No such luck. But the tree surgeon was nice enough to cut it off while he was up there, no extra charge. It was rotten, anyway. And happily, he asked if there were any others I needed off as well. Happily indeed, because there was another branch that brushes my porch roof, and I was getting a sinking feeling thinking it would have to be left and I'd have to get the crew back out here on a whole separate call in order to get rid of it. Irrational that I should be so flooded with depression over it, but there it was. But the tree surgeon did ask, the offending branch is gone, and so is my sad. And so is the arbor vitae that stood outside my west front room windows. I wanted the tree surgeon to take it out four years ago, but he ran out of time and I never got him back to do it. It's taken care of now. I've long wanted to put a climbing rose in its place, and it doesn't do to envision how nice and big it would be now if I'd gotten it in in the Fall of 2004. My maple tree now looks very odd and lopsided. But I'm not prepared-- in all sorts of ways-- to give up on it yet. I asked if when its time comes could I have a sawmill take it and cut it up for boards, but the tree surgeon said No-- Too much danger of hidden nails or hooks in it, which could destroy an expensive saw blade. Too bad: Such a waste of good lumber. I tried propping the collapsed fence section back up, but couldn't manage it. It's a two or three person job. But I managed to get a couple bags of mulch under it, to take the weight off the tomato bush. If there's any hope for more fruit off that, it's strictly because of the tomato cage. Copping Out . . . or Facing Reality? No luck today finding any skilled amateurs to deal with my fallen tree problem. My friends with the chain saw seem to be out of phone contact; there's a good chance they still have no power. My neighbor Jim East* asked at work about a chain saw he knows of, but it's broken. Last night, while I was at choir, he was over here with his Saws-All, cutting more of the smaller branches off. "I was hoping I could do enough to get them off the fence so I could pick it up for you." But as he worked, he said, he heard an ominous creaking from up in the tree where the two severed limbs are supported only by a branch about 1-1/2" in diameter. Meanwhile, his four-year-old and the six-year-old twins from across the street were running back and forth between his yard and mine. Nope, the piece of fence wasn't getting righted last night! And anyway, the Saws-All blade broke, and he didn't have a spare. So . . . the tree surgeon called me back this afternoon. He gave me a price that isn't wonderful, but seems reasonable considering it's not that much more than he charged me in June of 2004 when another limb of the same tree came down and took out a portion of the fence . . . You have to consider the higher price of gas, at the very least. I got him to come down a bit by leaving out the small branches we cut down yesterday: I still want to grind them up for mulch. But you see, I did not get additional bids. I told this guy to come round and do it tomorrow morning. It'd take me to the end of the week to get callbacks from other arborists, everyone is still so busy, and by that time, those branches could come down and go through my porch roof. At least, that's my reasoning. And by hiring it done, I'm not running the risk of some friend of mine getting brained by an errant tree limb while he's doing the chainsaw polka with it. If anyone is going to be brained in the process, let it be the professionals with their own insurance. But of course, I want no one brained at all. Not the tree surgeon, not the kid next door, not my dog, not me. Easy to say I can't afford to pay to have it done professionally, but can I afford not to? And as soon as possible? That's what I'm telling myself-- if I'm not just copping out. "Where's the path?" queries my dog. "Where's the path!?" I tried cutting as much of the fallen branch off with my loppers as I could. They're supposed to handle 1-1/2" material. I found it hard to cut through thicknesses half that. I began to wonder if my loppers were bewitched. No, just bowlegged, badly-adjusted, and woefully in need of sharpening. And I needed lunch. Inside to make phone calls, to the tree surgeon and to all my friends who might have chain saws, woodchippers, etc. Got everyone's message machines, surprise, surprise. If they weren't at work, their lights were still off, or they were out in their own yards cleaning up their own debris! Late in the afternoon, I heard my neighbor (I'll call him Jim East*) in his yard, raking up the mess from my tree. Only sporting to go try again with the loppers. I seem to have gotten better at my technique by now, such that by the time I had to change to go to choir practice, I'd removed all the leafy branches that were intruding into their yard, and a great deal of what was lying on mine. The fence doesn't appear to be broken, just pulled apart. Once I get the tree off the section that's down, I can stabilize the post that's knocked askew and put the fence panel back up. But that can't happen immediately. The fallen limb with its branches and sticks is bearing on that panel and the ground like a fist, but up above the limb is totally severed from the tree. It's just resting up there. If the branches on the ground aren't cut right, the whole thing could come crashng down and land wherever, like on the house or across the vegetable garden. That doesn't mean I'll refuse the help of level-headed amateurs to get that limb down and cut up. It's a matter of taking advantage of whatever help offers itself first. My neighbor says his dad has a chainsaw, but he's using it at his own place. Hmm, I'm willing to wait! Ditto my friend in choir whose husband has a gas-powered wood chipper. Apparently there's a waiting list for that, too. I am so not astonished!